Hyundai Amco and Hyundai Engineering, Hyundai Motor Group’s two construction arms, are expected to merge as soon as the National Tax Service completes its regular audit of Amco in March or April, multiple industry sources said Tuesday. Due diligence for the merger has already been completed, a source noted. This is part of the Korean auto giant’s succession plan for its chairman Chung Mong-koo’s son Eui-sun, the group’s vice chairman. The merger is also part of its step to refine the group’s cross-shareholdings and develop into a holding company, to be led by Hyundai Mobis. “There would be a big synergy as (Amco and Hyundai Engineering) businesses are different,” another source said. The source added that the merger could lead to a spin-off of Amco’s asset management business. Hyundai Amco mostly builds office buildings, hotels and corporate facilities such as research centers and factories, while Hyundai Engineering focuses on plant construction projects. Their combined sales would reach 5.4 trillion won ($5.1 billion) based on their 2012 revenues, with the new entity becoming the nation’s eighth- or ninth- largest construction firm. The merger plan includes transferring a 35 percent stake in Amco owned by the group chairman Chung and his son Eui-sun to Hyundai Mobis. Mobis, an auto parts and chassis modules maker, owns significant stakes in Hyundai Engineering & Construction and Hyundai Amco. The chairman and the group’s key subsidiary Kia Motors together hold about a 24 stake in Mobis, according to a regulatory filing. As Amco and Hyundai Engineering complete their merger, the next step would possibly be merging with Hyundai E&C to keep the group’s construction business focused, sources said. 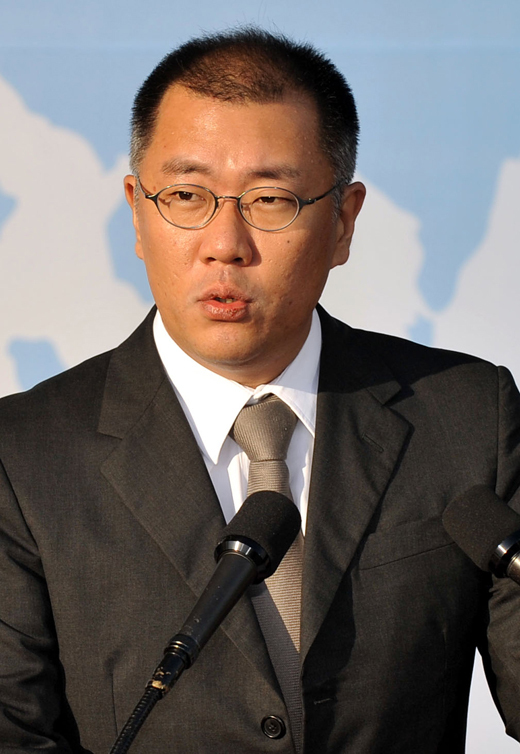 The junior Chung is also a major shareholder of Hyundai E&C. Hyundai E&C, the largest shareholder of Hyundai Engineering, disclosed via a regulatory filing Tuesday that its subsidiary Hyundai Engineering is considering merging with Amco, but nothing has been decided yet. It added that it will make another public disclosure in a month should it come up with a detailed plan.